It is a fact often lamented by weary first-time parents that babies do not come with an instruction booklet. If they did come with an instruction booklet, here’s what it might say. judge you for ballsing up your first parenting task. Once you have named it, be sure to register the baby’s existence with the Registry of Births, Deaths and Marriages so that you may endure a lifetime of filling out forms and producing at random the birth certificate of this new person whenever it’s least convenient for you to do so. You will need to have a hard copy of the birth certificate for the rest of your life. If you misplace it, we will deny all knowledge that your or your baby ever existed and create a labyrinth of hoops for you to jump through to prove that you are who you are and that you actually own this baby. You will be made to go to the post office, Centrelink, Medicare and various other government run organisations where we will make you take a number in one of our elaborate ‘Take a number here and go over there, not there, here, not here there. Wrong number, please start again’ systems and stand in a queue for hours. We will also give you misinformation that confuses you and obfuscate when you ask us pointed questions about why things are the way they are. This is simply because we enjoy punishing people who lose hard copies of important things. At three months, the baby will require a completely new instruction booklet. Please apply for this online so we can put you on a mailing list and spam you for the rest of your days. You will also need that birth certificate we talked about. 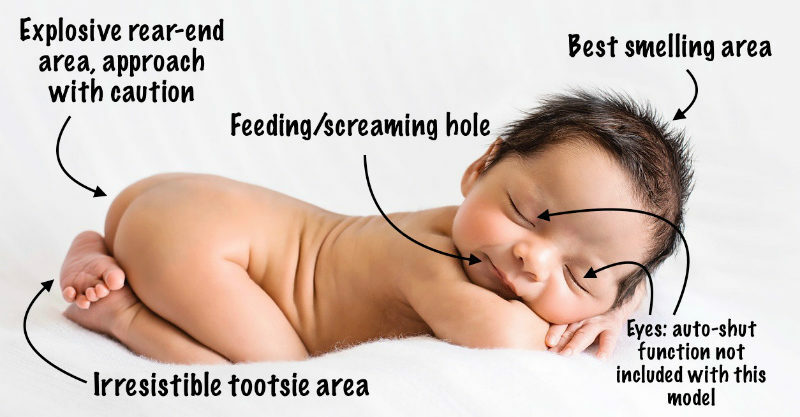 For more detailed instructions for your newborn baby please read on. Your baby will be difficult to please and will not be able to express what its problem is, other than to scream its head off. You will have to try and guess what your baby wants. We have no idea how to help you other than to say, if it’s crying, try feeding it, changing it or putting it to bed. Beyond that, you’re on your own. Unexplained crying or weird facial grimacing that appear to be associated with feeding, but no one really knows. So, good luck with that and remember, there is a strict “no returns” and “no refunds” policy on newborn babies. It’s buyer beware. Your baby will poo its own bodyweight in peanut butter baby poo every day. Rest assured this is normal. You will need to change your baby’s nappy after every feed and before every sleep. The first time you try to leave the house and have a latte with one of your non-baby-friendly girlfriends. Again, this baby comes with no guarantee – so good luck and remember, no returns, not even if the baby sh**s all over you in your favourite cafe. Your baby will need a bath once every few days. Sometimes a bath may soothe your baby and help it sleep. Other times, the soothing lavender bath will just make your baby scream its head off. No one knows why, but it’s all part of the no returns, no guarantees policy that your baby comes with. When lifting baby out of the bath be aware that your baby will suddenly morph into a slippery octopus. For this reason we recommend that bathing your newborn for the first time should be a two-person job with soft things all over the floor for nervous parents. Put your baby in its cot or bassinet and tip-toe around the house whispering. Baby’s eyes will not close automatically. If you are experiencing issues, please consult the troubleshooting guide below. Baby appears to be doing everything normally but you're still suspicious that something may be wrong Go straight to the hospital and enjoy the sweet relief when a nurse tells you there's absolutely nothing wrong with your baby. Baby smiles but your mother-in-law tells you it's wind Assume that the baby is smiling because it's the least it can do after all the crying and not sleeping. Baby has been sleeping for too long Let the baby sleep! Do not under any circumstances go in and poke the baby until it wakes. Good luck! And remember, your baby comes with a lifetime satisfaction guarantee. Which means, you are guaranteed to love it no matter what it puts you through. This is both a good thing and a bad thing, depending on how you choose to look at it.